If you grew up in North America, like me, you’ve probably been camping before. Perhaps you had the great fortune to be raised in a family with a mini van, or a station wagon, and a stinky old canvas tent you would take to the woods a few times a year. What happened next was magic: you watched your dad and brother chop wood, attempt to get a fire going, and then erect a very dubious-looking tarp to shelter the family from the ever-present drizzle. Meanwhile, you tried to stay warm and/or dry and/or away from mosquitoes, while dreaming about what meal would come next… beans and wieners, or crackers and peanut butter? All while yelling whiterabbitwhiterabbitwhiterabbit to try to magically avoid the smoke monster rising from the fire. Getting a camping team together and dragging them away from their regular lives for a weekend (or more) in the woods is one of the most satisfying activities I pursue, and I try to camp at least six times a year, in all seasons. However, I have noticed that the men in these camping teams still take on almost all of the work that my brother and dad did when I was young. In fact, left to my own devices in the woods, I have a hard time remembering how to light a camp stove, let alone design and build a useful shelter from the wind. Instead I spend much of my camping energy re-arranging the picnic table, planning elaborate (and ultimately very ashy) meals, and pouring myself yet another glass of wine of the cardboard box variety. Because I would like to share these joys with you, and also learn some new camping skills from other women, I invite you to join me on this site. I look forward to exploring the possibilities, challenges and joys of all-female camping excursions with you. Yes, the men get to stay home this time. Perhaps this is the only way we’ll learn how, exactly, this god-forsaken tent pole fits into that one. Or what meals, treats and experiences we might create, while we enjoy a campfire we lit and stoked for ourselves. Or how (and why) to master the art of throwing hatchets at trees. While swilling whiskey from a plastic sippy cup. Join me, friends. This is Lady Camping. We do a “Ladies Only” Weekend at our Boy Scout camp here in Rome, Georgia. 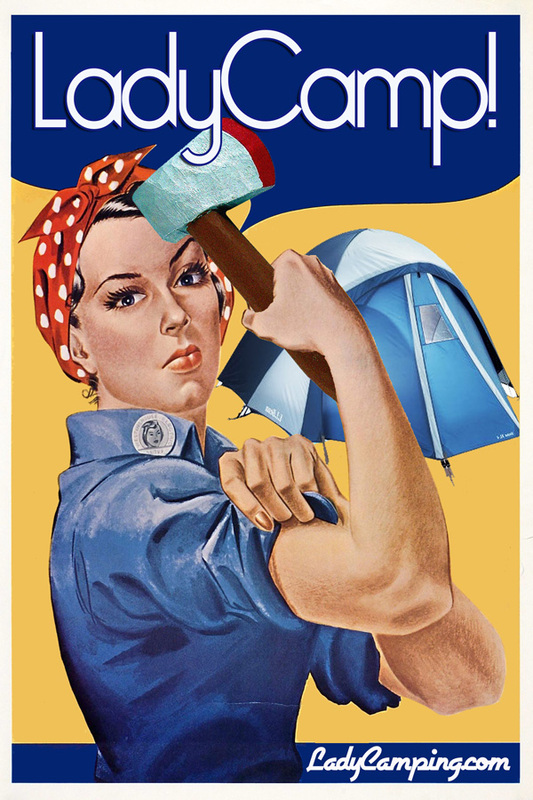 Could we use your LadyCamping.com “Rosie” logo as a screenprint on our shirts for our upcoming weekend (about 20 ladies planning to attend)? I hope you got my email! Thanks for getting in touch and I hope you had a wonderful getaway! I did and thank you so much. We are hoping to grow the Ladies Weekend, it was small this last time but we’ve already had people asking about next year. Again thank you.